This article by Jennifer Staron originally posted June 30, 2014 by Habitat for Humanity International. Fun home decor wall art can be made out of some of the most basic materials. Follow this step-by-step tutorial below to create your own wall art from items you probably have sitting right outside your front door. Picture frame(s) or mirror frame(s): Purchased at a local Habitat ReStore. Paint: Spray paint, craft paint, etc. Rocks: Go outside and grab some, or use some from a vacation destination or local sentimental hangout. Super glue: To be extra prepared, have some nail polish remover handy in case of a glue mishap – it happens to the best of us. Choose a solid color, or get creative with a design. Make sure to read the paint directions and allow proper drying time between coats. While the paint is drying, measure the inner frame size, and cut the cardboard to fit. Customize to your liking. Add movement with a free downloadable design template. (There are many available online.) The cardboard used in this example had a chevron design on it. Place the rocks and twigs on the cardboard. Get an idea of how they will fit together. Trim the twigs and wash the rocks if necessary. Glue each piece in place. Once the glue is dry, draw the bird beaks and legs. Customize with names, funky hair or accessories like a hat! Leaving off the glass, place the cardboard into the frame and secure. Hang your finished work or display on a table. These also make great gifts. Enjoy! Those who contribute an hour, a day, a week, or even longer put the mission of Habitat into motion. 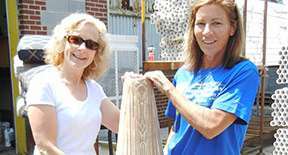 Your local Habitat for Humanity ReStore is a great place to put your talents to work.